Home / 2D animation / CP / TV / UK & Ireland / Watch 'Poppies' the BBC's Beautiful Remembrance Animation. 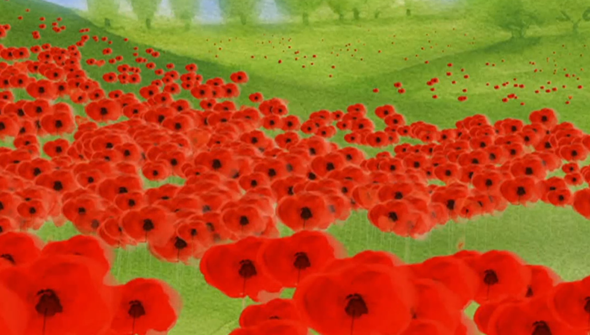 Watch 'Poppies' the BBC's Beautiful Remembrance Animation. The eleventh hour, of the eleventh day of the eleventh month was the time when the guns of the First World War fell silent. It's for this reason that November the 11th is the day that many countries choose to remember the fallen of the two World Wars (and the conflicts since). This year's commemoration has added significance due to the fact that 2014 marks a hundred years since WWI broke out. The BBC has commissioned a variety of programmes throughout the year to mark the centenary- including a special animation aimed at young audiences. The BBC's Children's department produced the short names Poppies to air simultaneously on the corporation's two children's channels. This meant that they faced the challenge of producing something suitable for both the very young children targeted by Cbeebies, and the older kids who watch the older-skewed CBBC. While wanting to create something that paid respect to the occasion, they also needed to avoid traumatising their young audience. They decided that animation would be a suitable medium, that would be accessible to all. Their decision really paid off, with the resulting film a moving and evocative piece of work. The film presents a respectful look at a World War One Battlefield through the eyes of the animals who live there. Brought to life with beautiful hand-drawn animation, it is accompanied by a beautiful score from Gravity's Oscar-winning composer Simon Price. Poppies is directed by Simon Partington and designed by Rachel Tudor Best. It was first shown at 11 am on Remembrance Sunday and repeated at 11am on Remembrance Day itself, across both BBC Children's channels, during the traditional two minutes silence. UK readers can catch it on iPlayer until Sunday. The BBC also released a video on the making of the film, which you can see below (may not be viewable outside the United Kingdom).